On Jan 5, 2008 I did the San Diego Brevet Series 200km. First off let me thank my sponsors who keep me equipped and fueled. Sportquest– makers of Carbopro 1200, Interphase and other fine products, Kenda Tires, and Woolistic makers of the best wool clothing and as always my club Team Velosport/ TEAM SHO-AIR/SONANCE. It was forecasted to rain … rain alot. Much to my chagrin, the weather forecasters got it right this time. It rained and rained and rained some more. It rained for the first 5+ hours and didn’t taper off until I reached the coast and was heading South towards the finish in La Jolla. I finished 2nd (yes I know brevets are not races, but don’t tell that to the frontrunners). My time was 7:56 for 125 miles with over 7,200 feet of climbing. Not bad considering I had only ridden six times since Thanksgiving (bad cold), the weather, not being able to descend at full speed, getting lost twice and navigating in the rain while riding is difficult at best. That is the short story those wanting more details read on. The two biggest decisions I had to make the night before were which bike to ride and what rain jacket I was going to wear. The bike of choice ended up being my custom Serotta CSI– Sarah. Yes my trusty ol’ steel bike got the nod. I would like to ride Sarah for the entire brevet series and wanted to get my position dialed in. Sarah is a recent rebuild with a new fork and new cockpit. As far as wheels, I went with Easton Orion II because they are comfortable and come with traditional round spokes. Even though I own a pair of Mavic Kysrium SLs I don’t ride them in stormy weather because bladed spokes can be a handful in crosswinds and on stormy weather rides you never know which way the wind will catch you on a descent. I also didn’t want to ride my Powertap. For tires, I rode my Kenda C2C’s because I know I wouldn’t puncture. I inflated them to 100psi instead of the usual 120psi because I wanted just a little larger contact patch on the road. I went without lights because I typically finish the 125 mile loop in fewer than 8 hours. On days when inclement weather is imminent I love wearing my Assos bib knickers. The pad is great and the material is ideal when getting rained on all day. My legs didn’t feel cold at all. Up top I wore a Woolistic long sleeve baselayer and a Vitadello Long Sleeve also from Woolistic and both made from 100% Merino Wool. Now the jacket. There were three jackets in contention. 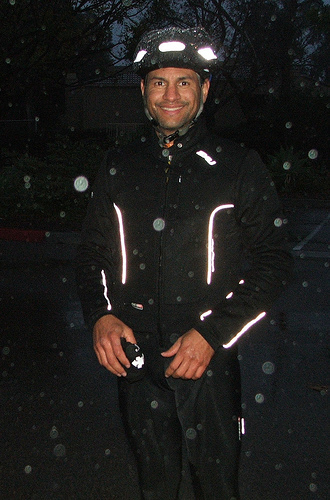 My Adidas rain jacket, my 2XU Membrane Jacket and my O2 Rainwear. Three jackets to be shared by two riders since Brandy would be doing an 80 mile ride on the same day. My preferred jacket would have been the O2 Rainwear. But I have put on almost 15lbs since RAAM and the O2 didn’t fit with the wool base layer and the wool jersey. Good thing Rainshield is sponsoring me this year now I can get a larger size. Then I tried on the Adidas rain jacket and realized (had never worn it yet) that it didn’t have any vents. So from three jackets down to one jacket. By default, I would wear the 2XU Membrane Jacket. Well I am here to tell you that less than one hour into the event I was soaked. So much for the claims of “impossible” penetration. The 200km is the most popular of the San Diego Brevets. It attracts first time brevet riders, roadies, triathletes and of course experienced ultra riders. In the past I have seen the turn out range from 30 to over 100 last year (PBP year). Today’s turnout was a scant 15 riders. The rain and the impending winter storm kept many riders in their nice warm and comfy beds. The start was a rolling start. I noticed people were slow in getting ready and at 7am sharp a small number of us rolled out. Mark Raybeck, Bruce Taylor, Jerry Brown, Ian Prowell, Tim Sullivan and I rode together the first three miles or so and then it was just Mark, Bruce and myself. Mark, Bruce and I reached the first control together. There was coffee and restrooms in an RV. I was in and out in a couple of minutes. I knew I didn’t have the legs to keep up with Mark and I needed a jump. Mark caught me on the climb up Old Castle Rd. Shortly thereafter Bruce caught and passed me while still on Old Castle Rd. I kept Bruce in sight through Lilac, Couser Canyon and eventually caught him on Rice Canyon on the way to the Rainbow Market. Bruce and I pulled in together to the Rainbow Market. By now Mark was long gone. I was in and out again in less than two minutes. Bruce and I said our goodbyes and I didn’t see him again the rest of the day. From here there was a welcomed downhill and then a climb up Hwy 395 from Hwy 76 and continuing on West Lilac until the “summit” of the day. To make sure we were on track we had an info control– the serial number of a fire hydrant on the course. And then another welcomed descent down Circle R to Hwy 395 and then Camino Del Rey. One of the tenets (mine anyway) of Ultra Cycling is not getting lost. Well I missed the turn on Old River Rd and had to double back. I lost a good 10 minutes off course. But hey that’s all part of Randonneuring right? The bike path we took off of Old River Rd was where I was launched for the official RAAM start back in June 2007. It brought back a thousand memories some good some not so good but all in all a huge sense of accomplishment!!! Back to the brevet. On this same bike path I came across a territorial dog. He definitely took offense to me being so close to his “home”. As soon as I saw him I knew there would be trouble. Typically, I slow down shift into a good sprinting gear and just as the dog has chosen his “angle of attack” I punch it and avoid the dog. Well that wasn’t possible on Holly Lane. This street had speed bumps, potholes, and mud all over and all in very close proximity. I longed for a frame pump. He charged at me while barking and I had to think quick do I unclip and try to kick him away, or would that give him a better target, or should I steer towards him and force him to change his angle of attack, or should I try to sprint even though traction was almost impossible. As our trajectories met I decided to yell loudly (GO HOME! ), growl back at him, change direction towards him(since dogs have a tough time walking backwards let alone running backwards) and then I found a somewhat clear section to accelerate. Why this dog was allowed to roam the street is beyond me. Maybe his owner doesn’t like cyclists. This was an unmanned control. I went in, bought a banana and got my obligatory receipt. From the 7-11 onto the bike path and then to the coast. I had been riding solo since mile 60 and really wanted someone to share the work with me heading West into the wind. The headwinds were pretty strong but I knew I was homeward bound now. I reached the coast and knew I only had 30 miles to go. The rain had ceased and I was starting to warm up. I had been wet and cold for the last 6 hours. Only one hill left– Torrey Pines. Only one more wrong turn and then to the finish. This one cost me another 5 minutes off course. I arrived at the finish at 2:56 pm– 7 hours and 56 minutes since the start. I felt good, not overly tired not overly hungry and satisfied with my time. 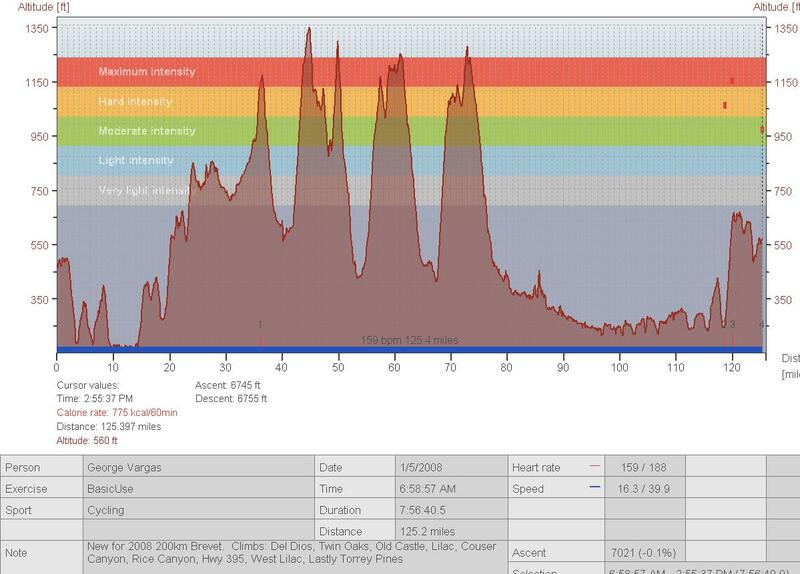 I knew my limitations based on the scarcity of my training rides since Furnace Creek 508. I had been sick since Thanksgiving and not getting in the miles. I was greeted by Stephane, Greg O. and his daughter. Greg’s daughter offered me a chocolate cookie and I gladly accepted. The cookies and my Endurox bottle were a great combination towards my recovery. The volunteers on the course make this event happen. Thank you to Mike Berry, RBA and all the volunteers whose names I’ve missed. I appreciate all your efforts. Once I got home I took a long hot shower. It felt good to be warm again. I put on my Skins Travel and Recovery tights and eat a nice hot meal. It felt good to be home. 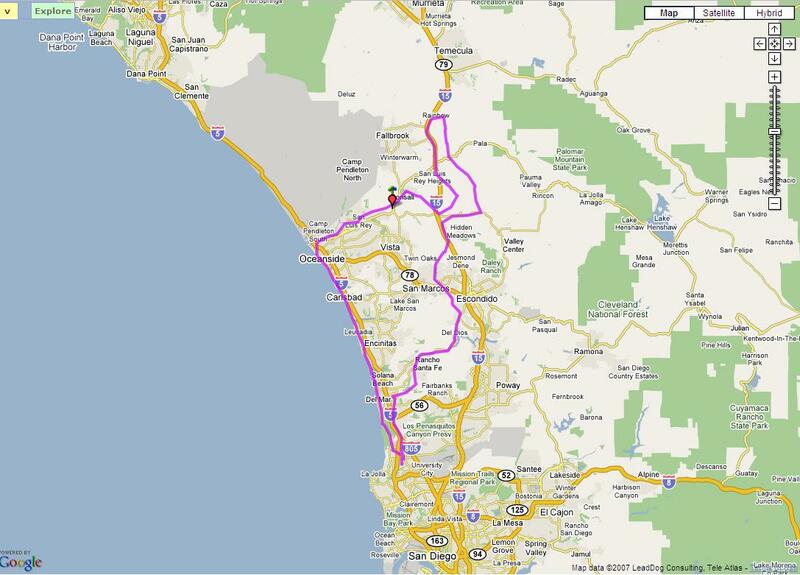 I will see you at the San Diego Brevet Series 300km. This entry was posted in brevets, events by REV Cycling Directeur Sportif. Bookmark the permalink.